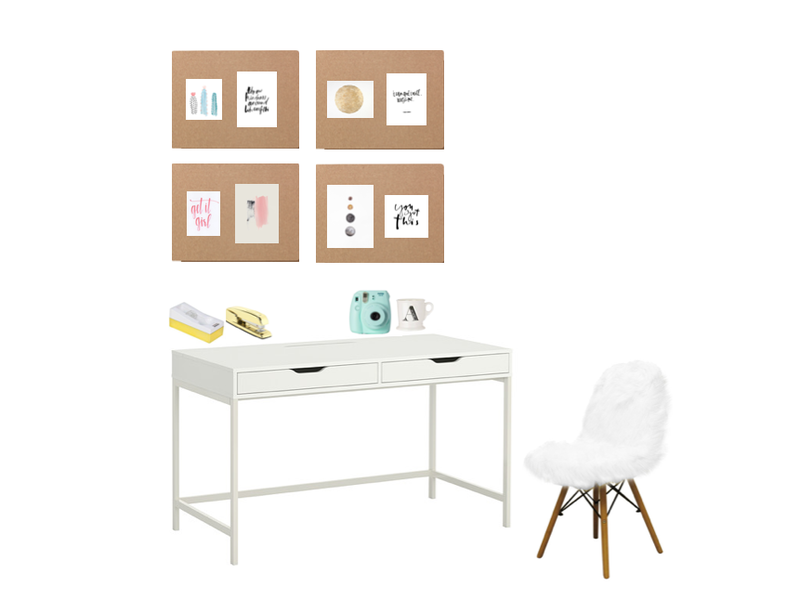 For today's Makeover Monday post we are going to cover the first concept design for my office. I am going to keep the walls in my office white. It makes the room feel bright and clean. Against the wall we have a white desk. I love how simple the desk is. It has two large drawers that are perfect for keeping all of my needs in reach. The desk also has built in cable management so I can hide all my pesky cords. On the right side of my desk I have a gold stapler and tape dispenser. Both necessities in an office but that doesn't mean they can't be cute! On the left side of the desk I have my polaroid camera and a monogramed mug. I love using my polaroid as decoration and it's nice to have it out in the open so I can grab it in a hurry. In the mug I store all of my cute colorful pencils. Another way to keep things practical and stylish. Above the desk I have four cork boards. On the cork boards I keep quotes, pictures, tickets for upcoming events, etc. The cork boards make it easy to update my office. I love decorating them for each season or holiday. For seating I have a furry white chair. Erik surprised me with it one day and I absolutely love the look.